The trouble with blogging is that sometimes life gets in the way and I can't find the time to blog. When that happens, a blogging backlog develops, and then you get posts like today's post. I'll start with genes and then go to skirts. My sisters' ages are symmetrically arranged, by sheer coincidence. Sharri is two years younger than I; then Alayna is five years younger than Sharri, Adrienne is five years younger than Alayna, and Christy is two years younger than Adrienne. And unlike Todd, who can remember when his sister was teething (he would have been three at the time), I remember nothing about when Sharri was really little. So it's no great surprise that I don't remember Sharri's lunchbox. According to Mom, Sharri had a Very Important Lunchbox. She took that lunchbox with her everywhere she went and was completely obsessed with it. Everything of any importance went into the lunchbox for safekeeping, and if the car keys were missing, Mom had to wait until Sharri was sleeping before she could look in the lunchbox to find them: you didn't mess with the lunchbox while Sharri was awake. When Alayna was small, Sharri and I thought the lunchbox story was hilarious, and we encouraged Alayna to carry her own box around. Alayna wanted nothing to do with our plans, but there we were, following Alayna around with a lunchbox, trying to cajole her into carrying it. Maybe the gene was passed along; recently Little has developed a fascination with shopping bags. She enjoys carrying her sketchbook and pencil, the old remote from the stereo, and whatever else she can find to put into her shopping bag. She insists on walking and dragging the bag along when we go out, which of course takes forever, but how can I say no when she's clearly so proud of herself? So of course I had to dig out my old lunchbox today. At first she was quite intrigued with it and carried it around on a test run or two, but her little fingers aren't quite adept or strong enough to manage the latch, so back to the shopping bag she went. Maybe in a year or two she can carry on her aunt's legacy. I'll try not to push it any more than I have already. By the way, that little denim skirt the kiddo is wearing in the photos is one I made so she'll have something to wear with the fun tights Sharri gave her. I've been meaning to sew it for months now but only just found a nice lightweight denim I liked. Fortunately the weather is cool enough that she can still wear it before summer starts. And speaking of skirts, Christy's skirt (from the waistband tutorial) is finished. I think it turned out well; I just hope it fits her and she likes it. I probably won't be giving a tutorial on this one; the instruction would frighten away everyone who's still left after the terror of the scalloped hem. No more skirts from me for a while. But speaking of scalloped hems, I'm thrilled to show you someone else's skirt! Betsy followed the tutorial and made this adorable skirt for (correct me if I'm wrong, Betsy, my memory is terrible) her daughter to wear while playing golf. I love her fabric choices and that fabulous pocket with the curved hem. Thank you for sending the photos, Betsy! The skirt is gorgeous - I just love the pleats and the fabric. How have you managed to keep them so sharp? are they edge stitched along the length of the pleat? I am busy thinking about fabric for the scalloped skirt but now want to make a pleated one too! Thank you for the tutorials and the inspiration. Your tutorials were great! I cannot wait to start the skirt one of these days. The pleats are pressed very sharply right now because they were basted shut during construction. They'll soften up during wear, although I did edgestitch the inside of the box pleat so it will stay crisp. I 'm glad you like it! And I'm glad the skirts have been inspirational for you. Gorgeous skirts all of them! I have a sewing machine, but I have yet to use it. For some reason, I am afraid of it. I need to get over it and make a scallop hem! Your most recent skirt is so lovely. my two older children are totally lunch box lovers as well. heaven forbid if you touch... secret treasures inside! your sewing is so lovely... the new skirt is beautiful, and i have always loved that fabric! stop with the skirts! they are killing me ... they are great!!!! You *may* have to do a tutorial on this one, too! Love the skirt! I'm making progress with mine, I'm doing the waistband today. It looks great so far, thanks for the help. I love the skirt, and the fabric is awesome. Haven't scared me away yet, and when I get time that scallop hem is going to be added to my skirt block. I have to have some fabric somewhere that is dying to be a scalloped skirt! 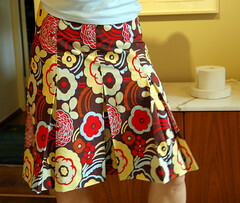 Forgot to say I posted of picture of my skirt in progress at my blog - which I think you can see by clicking on my name. Have you checked out Sock Dreams? They don't have Little's tights in your size, but they come close! The carrots are my favorites, though. You haven't scared me, Liesl. If anything, I may pull out my sewing machine and try some more quilting -- or at least sew the curtains I've been meaning to sew with this great silk fabric I have. As for lunchboxes: my kids are older than Little and they aren't interested in US lunchboxes: they have to have what every Dutch kid has. What a shame! I love them! Your skirts are inspiring me so much! I really want to make some skirts for myself, but the list I have to get through first is quite long. Thanks for reminding me of how much I want to do this! On the bag thing - I remember clearly when Amy went through this stage and it was hilarious (what am I talking about? she's still in that phase...). It escalated into a shop obsession - but after a few bruised toes from her not so capable grip we had to scour the supermarket for small lightweight things she could add to her collection for buying and selling. We also had to make sure they were toddler proof packaging after a few episodes of torn up packets of tissues strewn gaily about the house or packets of cereal emptied and ground into crumbs in the carpet. Soon we had a little fake shop counter propped up in a corner of the livingroom and all day we sat passing over tiny boxes of cereal and tiny cans of peas and corn. For our own amusement we also added a few novelty items when we could find them, like tongues in jelly (ew). So Amy learned to say 'tongues in a can' a little earlier than most! Thanks for the trip down memory lane! Love the skirt too... and those shoes! And since I am waaaay to fat for that style, I can just admire your picture without having to mess with box pleats. Love your wonderful fabric choice! I love that skirt and the wonderful fabric... in awe!